Joyously Domestic: Peanut Butter, Banana and Chocolate Chip Oatmeal "Muffins"
Peanut Butter, Banana and Chocolate Chip Oatmeal "Muffins"
I have been on a hiatus (of sorts) from blogging any new recipes for a couple of months while we're remodeling a house that we just took possession of in July. (Are we close to completion? Thank you for asking. But, nope. Not even close. We're getting there, though.) We've been up to our eyeballs in cabinet staining, drywall work, mudding and such ... all those super-de-duper fun things that come along with most remodeling adventures. And, these scrumptious "muffins" were made ... and quickly devoured. These are not quite actually muffins in the true sense of the word - they are chewier and a bit denser than traditional banana muffins. (Having no flour in the mix makes them a little different than muffins, as well.) Regardless, they are darn yummy and are great on the go! They actually remind me of Quaker Oatmeal To Go Breakfast Bars - if you've ever had those. 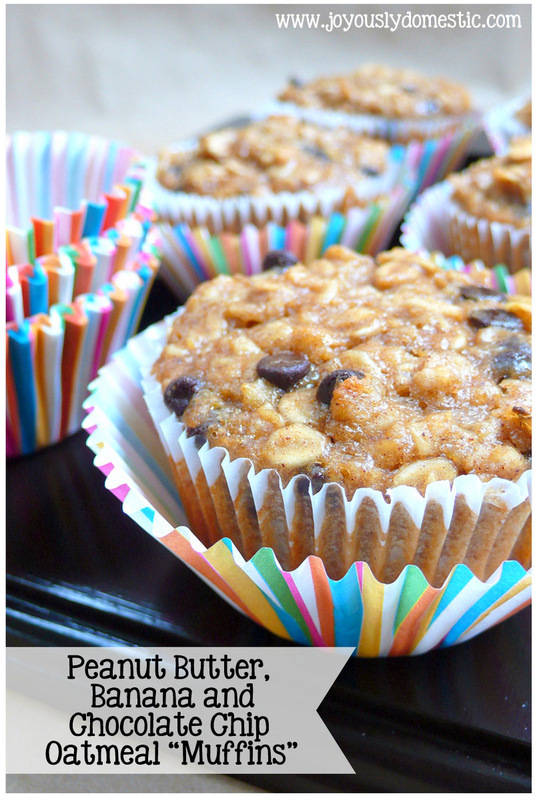 Who doesn't love the combination of chocolate, peanut butter and banana? They're made with stuff most of us usually have on hand and they're ready to pop in the oven in just a matter of minutes. They'll carry you through the morning and are, also, great for after school snacking. Combine the oats, brown sugar, baking powder, salt, cinnamon and nutmeg in a medium mixing bowl. Add in the vanilla, milk and beaten egg. In a small bowl, combine together the mashed banana, peanut butter and honey until mostly smooth. Add banana mixture into the oatmeal mixture. Stir until combined. Line the wells of a muffin tin with papers. Fill each paper just over three-fourths of the way full. Bake for 15 - 17 minutes. Remove from oven and allow to cool for about five minutes while still in the muffin tin. Remove from muffin tin and store in an airtight container once fully cooled. Can be served warm or at room temperature. Hello, Angela! So great to hear from you! Yes, the leaves changing already is crazy here in MI ... I just was pointing that out to my kids yesterday morning as we were taking our photos outside on our first day of school. Usually everything is still so bright green at this point ... but our trees have been changing for a couple of weeks now. I have heard that this winter is supposed to be another rough one. :( We have used a wood stove for almost six years at the home we'll be moving out of ... so I know the "fun" of stockpiling wood for the winter. We won't have to do that at the new house, so I'm thankful for that. However, there really isn't anything better on a cold winter's night that snuggling up by the crackling fire. So, I am sure to miss that. We'll have to wait and see how well the heating is at the new place ... it's a new furnace so that should do well. Now let's just see how much it costs to heat it ... we're going from a small house that was heated by wood stove to a house three or four times as big paying for propane. Yikes!